The Paulownia family consists of approximately 17 varieties of trees native to North American, China, Laos, Vietnam, Japan and Korea. Common names for these trees are the Paulownia, Princess Tree, Royal Paulownia, or Empress Tree. The are prized mostly for their showy clusters of violet flowers in the early spring that grow from panicles that are 3-11 inches long. The flowers themselves resemble a foxglove flower and many say the Paulownia is part of the Foxglove family while others categorize it as a member of the similarly leaved Catalpa tree. It has very recognizable large heart shaped leaves that grow on average from 6-18 inches across. This is a fast growing family of trees and when young, can grow up to 20 feet in a single season. This rapid growth habit makes it sometimes weak and succeptable to limb breakage or loss as it matures. Taking advantage of this rapid growth rate, some Paulownia plantations are able to harvest lumber in as little as five years. In China the Paulownia is both a popular roadside and ornamental tree. It's wood is also used to make sound boards for many string instruments throughout Asia. The lumber is also used in many agro foresty settings as the wood is light but strong. In Japan where it is called the Princess Tree, it was customary to plant a tree to honor the birth of a baby girl and then cut the tree at the time of her marriage to craft a piece of furniture for her new home (often a dresser or chest). Because of the tight grain this type of wood it is also used to make guitar bodies, skis, chests, boxes, and traditional wooden clogs. 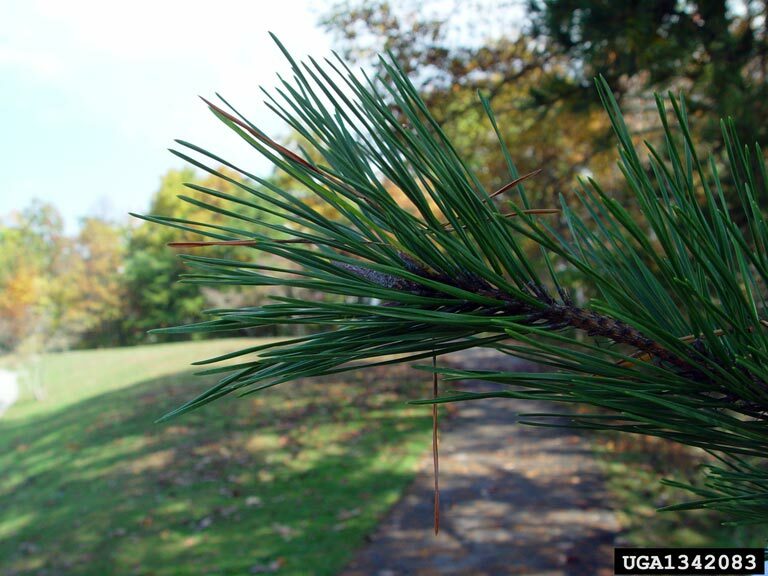 The Table Mountain Pine, Pinus pungens is a small to mid sized scruffy looking tree that reaches heights of only 50 feet tall. It has an irregularly shaped crown that is filled with twisted limbs and clusters of barbed cones. 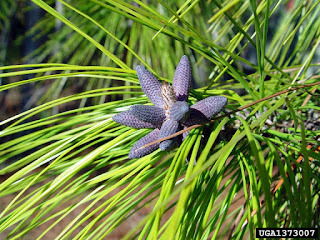 The Table Mountain Pine can generally be found growing above 2500 feet in elevation in only the southern mountains and other higher elevations of the piedmont from New York in the north to Georgia in the south. The bark of the Table Mountain Pine is red brown and furrowed into moderately thin, rounded to flat scaled plates on the lower portion and rough to the touch. 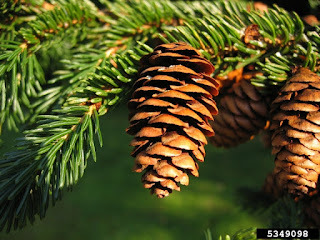 The leaves are in the form of evergreen needles are 1.5 to 3 inches long and grow in bundles of 2 each. 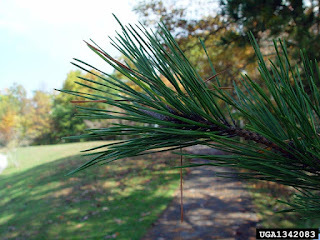 Needles are dark green in color, thick and stiff sometimes twisting. 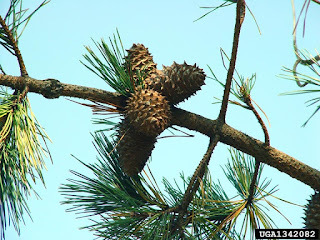 Cones are the easiest way to identify this particular tree, they are short and fat with thick, sharp hooked barbs on the scale ends that resemble a mini - rhinoceros horn. When viewing a cone from the tip down, there is a visible spiraling pattern. Some cones are so tightly closed that only the heat from fire is able to open them to release their winged seeds. 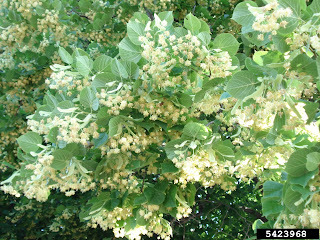 The Littleleaf Linden is found commonly in the United States though it is actually native to Europe. 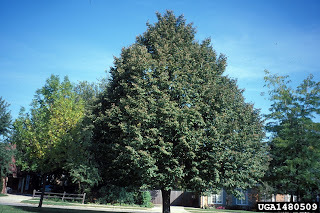 it is used frequently as a street tree or in park settings throughout the United States. it has a pleasing shape, dense canopy and very fragrant flowers. At maturity it can reach heights of 50-60 feet tall with a spread of up to 40 feet. Growing at a medium rate it can grow 12-24 inches in a single year. It grows best in full sun or partial shade in acidic, alkaline, moist, sandy or clay soils. It does not do well in extremely wet or dry conditions. The blooms appear in the summer later in the season when most other trees have finished. they flowers hang on a long stalk with an attached wing like leaf. The flowers are a great source of nectar and pollen for bees, hummingbirds, and other pollinators. The fruits are 1/4 inch in diameter. The leaves are heart shaped and lopsided at the base. Leaf sizes vary from 2-3 inches long with a slightly saw toothed margin. The color of the leaves range from light green to a deeper glossy green, shifting to yellow in the fall season. The soft wood cavities provide ideal nesting sites for birds that prefer cavity dwelling. The wood is considered a soft wood and does not have any significant value in the lumber market. The Black Maple - Acer nigrum (also called the Black Sugar Maple, Hard Maple, or Rock Maple) is a medium sized deciduous tree that can reach heights of up to 80 feet tall. The tree generally has a relatively short trunk with large rounded crown full of long upward reaching branches. The bark of the Black Maple is black to brown in color with a silver gray layer on top. The trunk of the Black Maple is often fluted which gives the tree a rougher appearance. The leaves are simple and grow opposite from one another, as opposed to being side by side. The lobes are often coarsely toothed before ending in narrow blunted tips. The upper leaf surface is smooth, dark green in color, wile the lower surface is lighter and duller in finish. 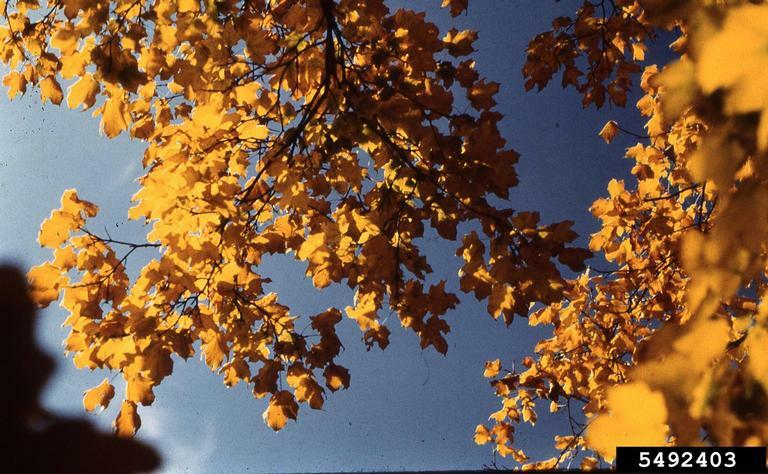 The leaves become yellow to yellow brown in the fall before falling off. The leaf stalk or petiole is long and often fuzzy. The bodies of the paired fruit are joined at the stem with flat wings hanging down from each side. 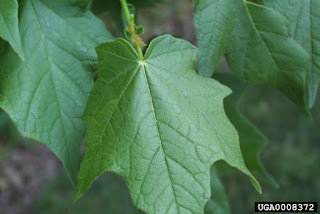 The Black Maple is very often confused with the Sugar Maple, with which it freely hybridizes. Both the Black and Sugar Maple are tapped for Maple Syrup, planted as shade tree and sold in the commercial lumber market as hard Maple. 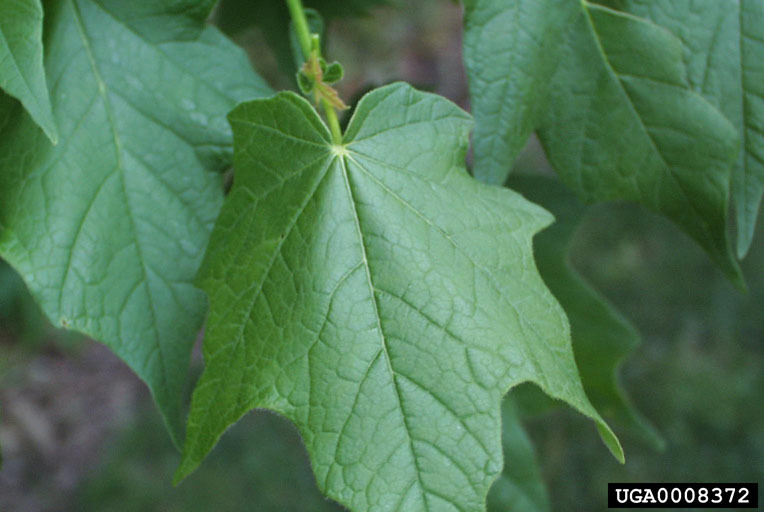 The Black Maple can be found growing from The Great Lakes in the North to Tennessee in the south. The name Horse Chestnut was thought to gain it's origin from the false belief that this tree was part of the Chestnut family, combined with the fact that despite the fruits being poisonous to horses they actually cured some chest related ailments when eaten by sick horses. Although the Horse Chestnut is sometimes confused with the closley related American Buckeye, that name is generally reserved for the North American members of the Aesculus genus. The Horse Chestnut differs from the American Buckeyes because of it's shiny orange-brown terminal buds, bigger leaves on stalkless leaflets, 1 foot tall heads with predominently white flowers and very prickly husks that enclose the mahogany colored seeds. Each individual flower opens to reveal a bright splash of yellow at the base of every petal, once pollinated this yellow turns a deeper orange and then finally a crimson red. The flowers provide a rich source of nectar and pollen to insects, especially bees. Caterpillars of the triangle moth and horse chestnut leaf miner moth feed on the leaves. Deer and other mammals eat the conkers. The most famous use of Horse Chestnut is in the game of conkers. The first record of the game is from the Isle of Wight in 1848. The wood of the Horse Chestnut is soft and often considered weak. It has a very straight light colored grain and is often used for wood turning, artificial limb production and wooden toy making. This weakness can be considered a liability as mature trees in full leaf have been known to drop large branches without warning during heavy storms. 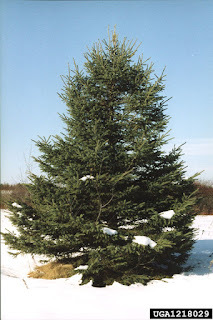 The White Spruce - Picea glauca, (also Canadian Spruce, Skunk Spruce or Cat Spruce) is a medium to large sized evergreen tree that can reach heights of over 100 feet tall. 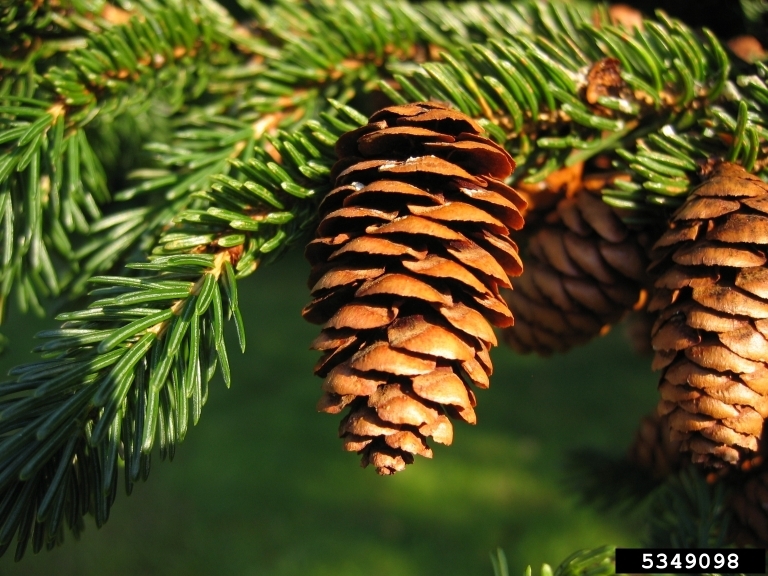 White Spruce is a commercially important tree, it wood is lightweight, straight grained and resilient. The lumber of the White Spruce is harvested for both lumber and pulpwood. Mainly found in Canada it's growth range enters the northern United States from Minnesota through Maine. 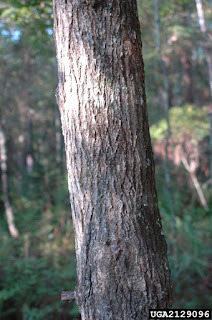 The bark is light brown is thin with a whitish inner layer. The leaves are in the form of four sided needles, blue green in color with white lines on the bottoms. The needles appear to grow on top of the branches as they sharply turn upward and wrap around the twigs blending in with the ones growing on the upper surface. When crushed the needles release a pungent or foul odor. The sticky sap often oozes from the surface. The White Spruce is the state tree of South Dakota. 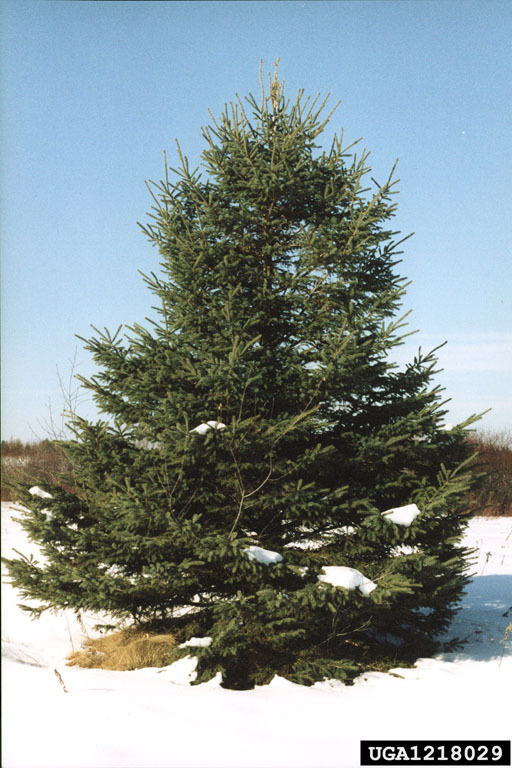 White Spruce is a favorite Christmas tree variety in the North Eastern United States, it is considered to have one of the best "wild" or "natural" appearance. Though the needles are poorly retained once the tree is cut, the limbs are thick and hold even heavy ornaments very well. 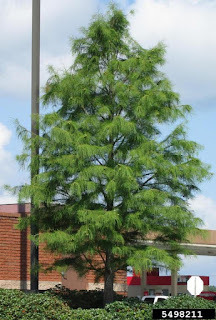 The Slash Pine - Pinus elliottii is a tall, straight, deciduous tree that can reach heights of 60-100 feet on average. 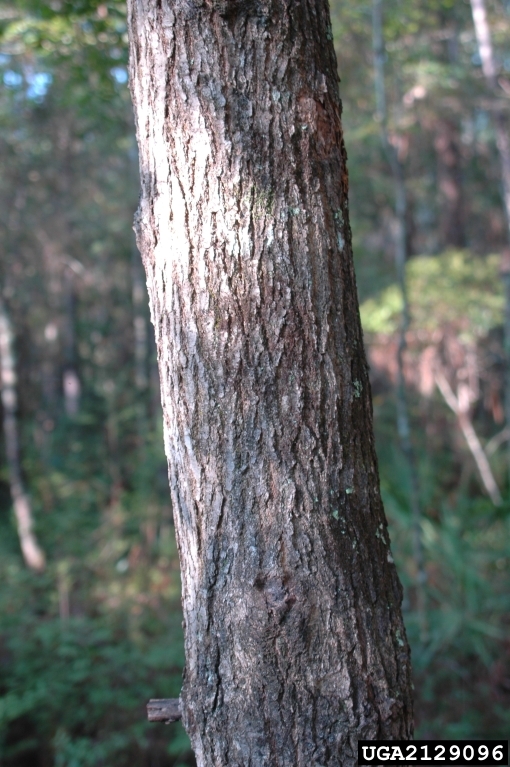 Growing in an upright fashion, Slash Pine generally does not have lower limbs along the trunk but has a dense rounded crown. 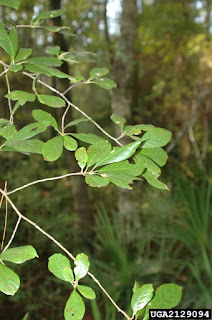 It is native to the United States mainly in the South from South Eastern-South Carolina, throughout all of Florida, and along the Gulf Coast through Louisiana. The Slash Pine is a rapid grower with a desirable form and natural resistance to southern Pine beetles, because of this it is widely planted along the coastal plain for timber production. 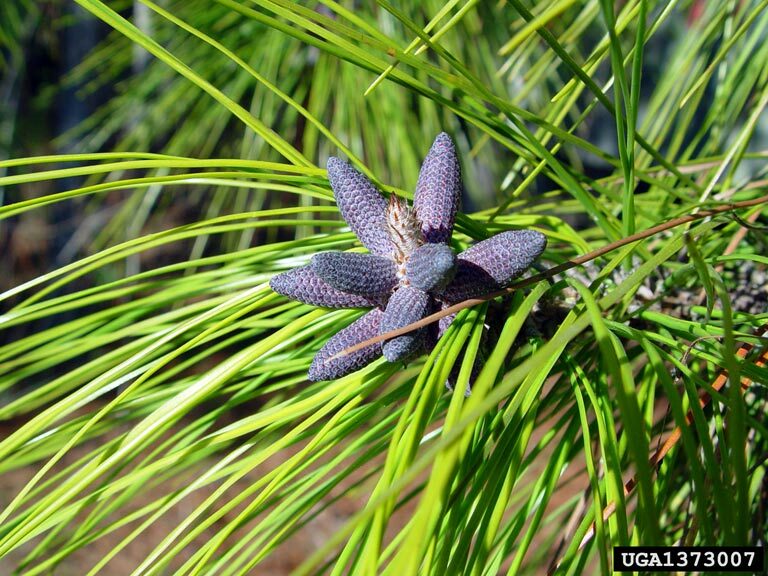 The trunk of the Slash Pine is mainly limb free, covered with large, flat, purple-brown bark plates and topped by a dense rounded crown with dark green needles. The needles are dark green, lustrous, stiff and 6-10 inches long in bundles of two or three. 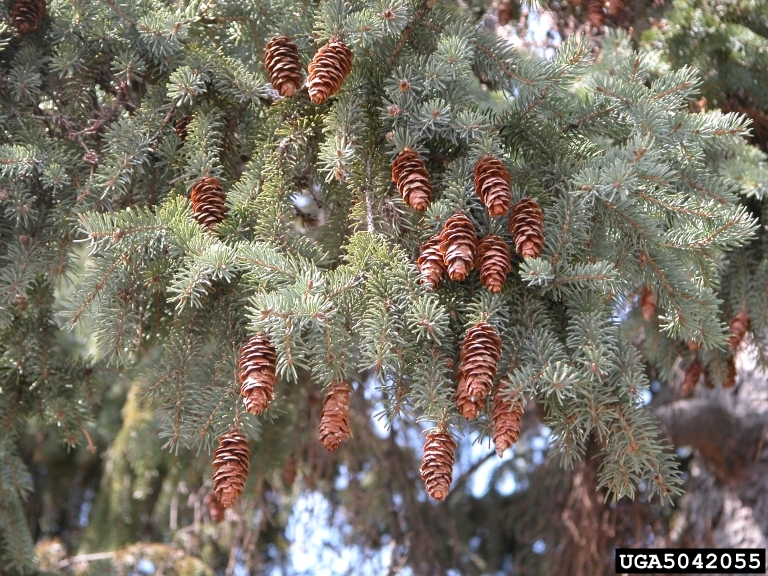 The needles grow in clusters near the ends of otherwise bare orange-brown branches that resemble brooms. The seeds are winged and borne in cones that range from 5-8 inches long and grow tilted back towards the trunks. The Chinkapin (Chinquapin) Oak - Quercus muehlenbergii is a medium to large deciduous tree. The name Chinkapin originated from the strong resemblance to the Allegheny Chinquapin Castanea pumila (a relative of the American Chestnut). At full maturity the Chinkapin can reach heights of 70 feet with a broad and rounded crown. It is a slow to moderate grower that does best in zones 3-9. Although native to these zones, Chinkapin Oak is sporadic within its range and is seldom a dominant species in a woodland. 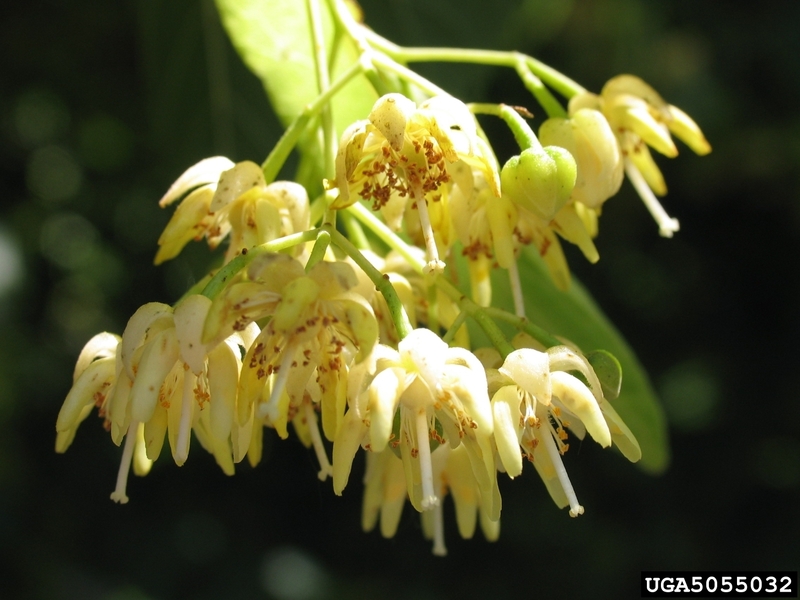 Its common associates include White, Bur and Black Oaks, Ironwood, Red Cedar and Hickories. Chinkapin Oak prefers well drained soils, bottomlands, limestone ridges, or along stream edges. It is also commonly found on bluffs, ridge tops, and rocky, south facing slopes. The leaves are alternate, oval, elliptical, or oblong in shape, 4" to 6" long and 1.5" to 2" wide. The leaf edges are sharply toothed in almost a serrated fashion. Male and female flowers appear separately but on the same tree in Spring. Male flowers borne on a yellowish catkin 3" to 4" long, while the female flowers are less conspicuous and reddish in color. 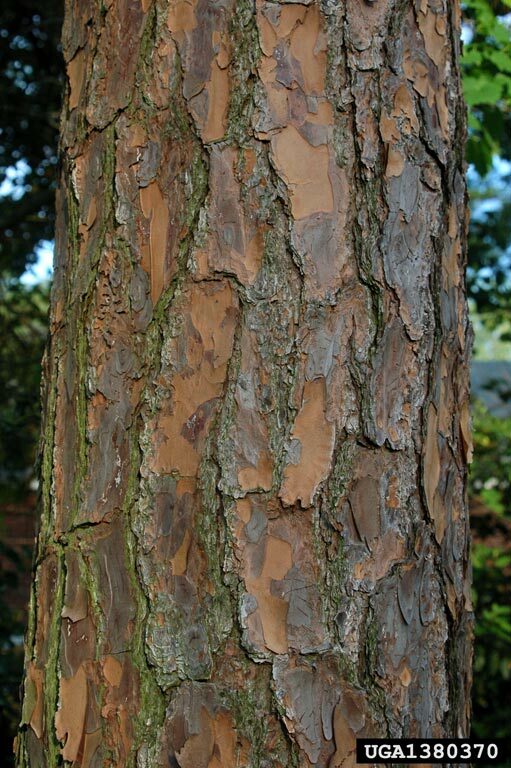 The bark is light gray in color, with short, narrow flakes on the main trunk and limbs, and deep furrows on older trunks. The wood of the Chinkapin Oak is heavy, hard, strong, and durable. It is used for making barrels, fencing, fuel, and occasionally for furniture. The Swamp Tupelo - sylvatica var. biflora (AKA Swamp Blackgum), is most often found as a small tree but can reach heights of over 80 feet tall. The Swamp Tupelo is filled with small branches that grow in almost perfect right angles from the trunk forming an open but unkempt crown. 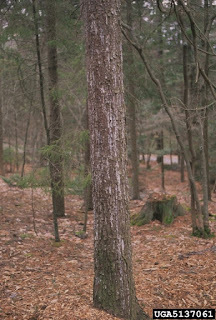 Mature trees often develop swelling near the base of their trunks. Bees are often found around Swamp Tupelo as they gather the flower pollen to produce Tupelo Honey which is highly prized. Their sour fruits are grazed upon by a variety of small mammals and birds. The soft wood is not commercially important but is sometimes used in local applications where a rot resistant wood is required. Swamp Tupelo prefers to grow in shallow moving water or swamp lands, and can be found from Maryland in the North through Florida in the South and west through eastern Texas and North along the Mississippi River to Illinois. The leaves of the Swamp Tupelo are alternate, thick and textured with short leaf stalks. The leaf blade is 1.5 to 4 inches long and .5 to 1.5 inches wide. The upper leaf surface is lustrous and green in color, the lower is pale and covered in hairs. The fruit is purple-black in color, sour in flavor, 1/4-1/2 inch long with a hard seed that has distinct ridges. The bark is silver-gray in color occasionally almost black in color with rough rectangular chunky plates and crooked furrows. The Pondcypress - Taxidium ascendens is a very large deciduous tree that can reach heights of over 100 feet and live to be over 500 years old. It is most commonly found growing in very moist areas, swamps or even shallow ponds. When growing in water the tree forms knee like structures around the base of the tree, this unique rooting habit makes the tree able to withstands high winds. 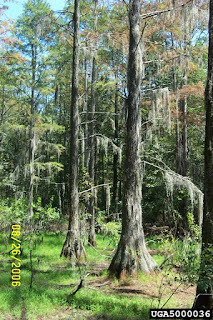 The wood of the mature Pondcypress is highly prized for it's rot and termite resistant properties. When young the tree grows in a conical shape, with age it will begin losing it's lower limbs and the trunk will become deeply fluted. Pondcypress leaves are in the form of 1/4 inch long needles that are lime green in color and loosely woven around thin soft center twigs that curve slightly out from the main branches. In the fall the lime green leaves change in color, first to yellow and then to a red-brown before falling off. To the untrained eye the Pondcypress may appear to be a dead evergreen tree during this time, this is not the case as the Pondcypress is deciduous in nature (meaning it loses it's leaves each fall/winter). The fruit balls of the Pondcypress are rounded in shape, rough on the surface and silver gray in color. 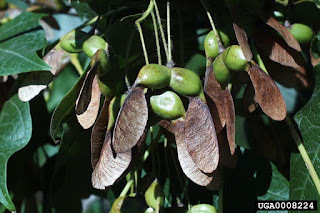 The fruit balls appear in the Summer and in the Fall open to release their seeds before falling off. 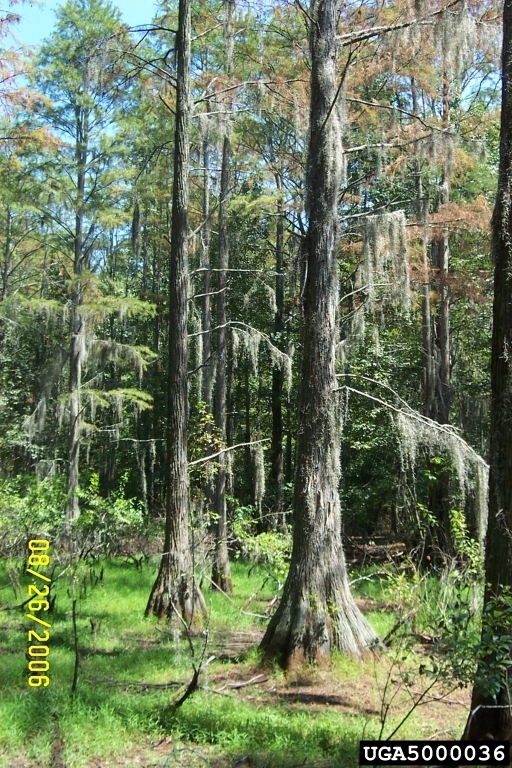 During the Winter season the Pondcypress and Baldcypress appear almost identical and can be easily confused for one another. Moringa oleifera is the most common of all of the Moringa genus. The Moringa are the only members of the Moringaceae family. Moringa oleifera has many common names such as the Miracle Tree (for the high nutrient content and said healing powers), Horseradish Tree (for the root flavor, often compared to horseradish), Drumstick Tree (for the slender seedpods) , Benoil and Benzoil Tree (for the oils derived from the seeds). According to tradition in parts of Africa (especially Ghana), the "Miracle Tree" and it's products have been used for generations. The leaves are extremely high in nutrient value and are said to have natural healing powers. The seed pods and leaves are eaten as a vegetable in many native areas and are used as an ingredient in herbal medicines. Not only does the Moringa oleifera's products contain high nutrient values it can also be used for water purification purposes. This fast growing deciduous tree can reach a height of 32-40 feet with a diameter of just 1.5 feet. The whitish-grey bark is surrounded by a thick cork. The young shoots have purplish or greenish-white hairy bark. The open crown contains drooping, fragile branches and leathery tripinnate leaves. The fragrant flowers are bisexual and contain five unequal yellow-white petals. In cooler regions the flowers only appear once a year in April-June, however in warmer regions with high rainfall they can appear twice a year or even year round. They appear on hairy stalks in spreading clusters that are 10-25 cm long. 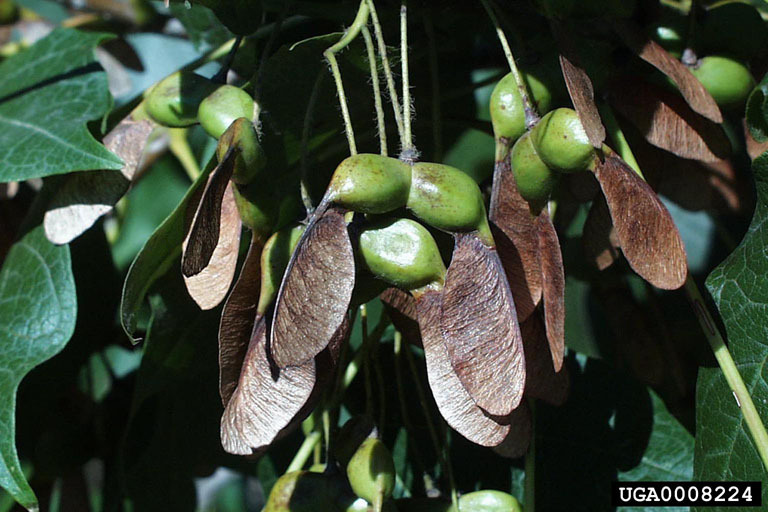 The fruit occurs in brown three sided capsules containing dark brown seeds winged seeds that are dispersed by wind and water. When cultivated as a crop it is cut back annually to allow the pods and leaved to remain within reach. The Moringa oleifera is the main focus of Moringa Connect, a program that provides registered farmers with seeds and resulting manure for crop expansion and harvesting purposes. It is also planted as part of the Feed The Future program, Feed The Future is a United States Government Global Hunger & Food Security Initiative that is currently focused in 19 countries. These programs along with the help of volunteers (including Peace Corp Members, Private and Corporate Sectors) allow areas that are otherwise void of reliable / nutritional food sources to be planted with a resource that will continually produce and reproduce to provide nutritional food for generations to come. 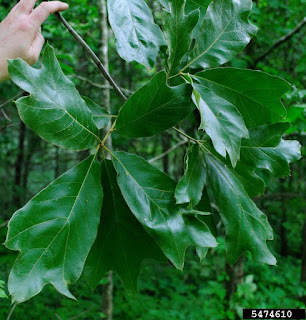 The Black Jack Oak - Quercus marilandica, is a small to mid sized deciduous tree that reaches heights of only 15 - 45 feet tall. 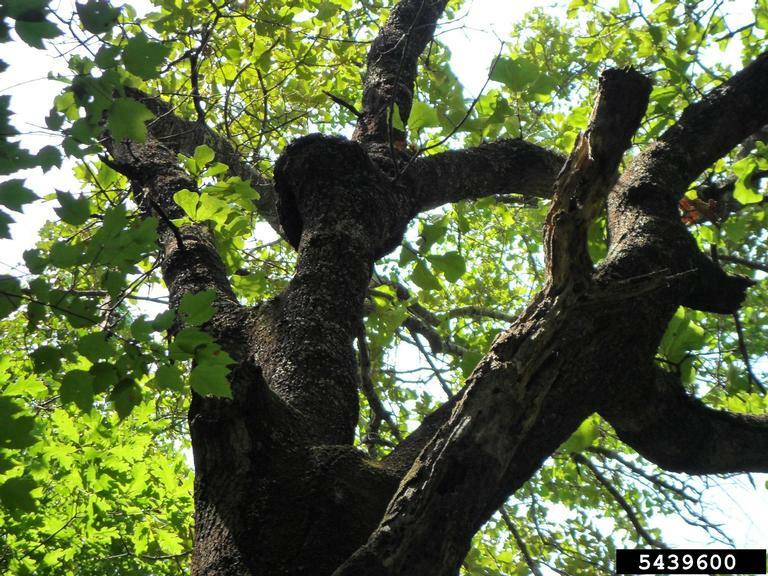 Black Jack Oak often grows in an irregular shape with an open crown and crooked branches. It is one of the fews Red Oaks that produce and store a substance called tyloses, this substance seals the vessels and make the wood watertight. 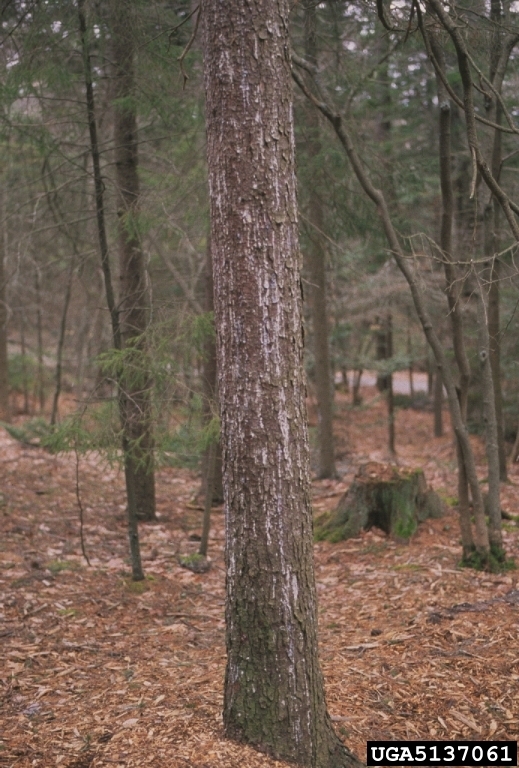 The small trees lumber is not highly valuable because of it's small size and knotty qualities it is used for fence posts, wooden water buckets, railroad ties, firewood and charcoal. Black Jack Oak is native to dry, sandy or soils from Iowa in the West, New Jersey and New York in the North, South through Florida, West through Texas and Northern Nebraska. 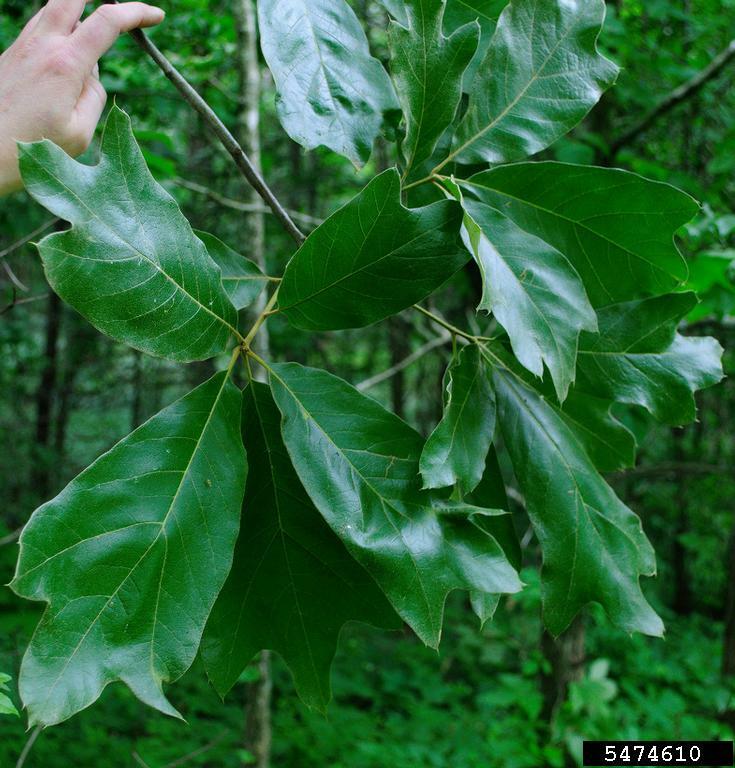 The leaves of the Black Jack Oak are tough and leathery, triangular and 4-8 inches long and wide. The leaf stalk or petiole and lower surface are covered with dense brown-orange hairs. The veins are raised on both the upper and lower leaf surfaces. Acorns occur singularly or in pairs on a short stalk with red-brown top shaped cups with hairy scales. The nuts are elliptic, 1/2 to 3/4 of an inch each, with a stout point. 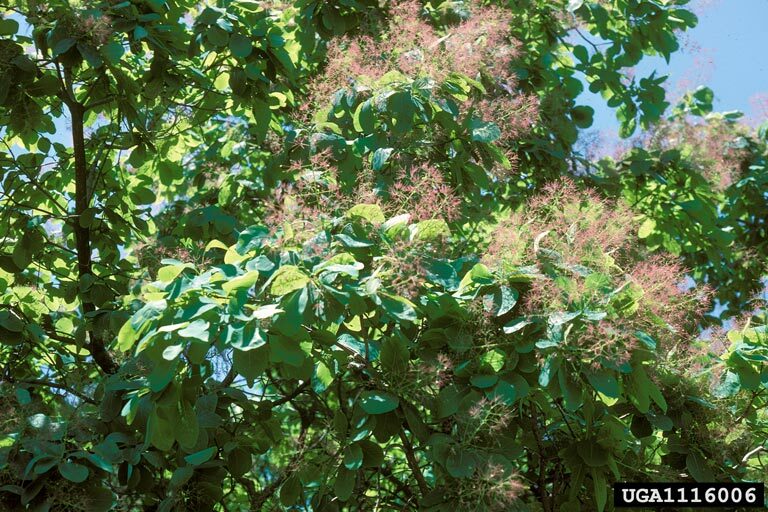 The American Smoketree - Cotinus obovatus is a small tree that does not reach heights of more then 35 feet tall. Generally having a short trunk and a full crown with widely spaced branches. American Smoketree is used on a limited basis as an ornamental and is valued for it's distinctive smoky plumed flowers and dark red fall coloring. This rare specimen is found growing on rock bluffs and in limestone glades from eastern Tennessee and Northern Alabama west through Arkansas, Missouri, Oklahoma and Texas. The leaves are alternate, egg shaped and are 2-6 inches long and 1 to 3 inches wide. The upper leaf surface is a dull green and the lower surface is lighter and hair covered. When crushed the leaves give off a distinctive mint odor. The pink flowers are in the form of hairy fluff that from a distance look to be puffs of smoke, giving the tree it's unique name. 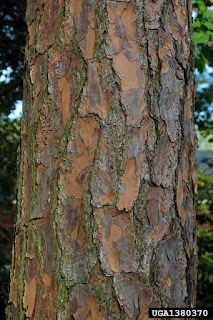 The bark is light gray to gray brown and thin, flaking and peeling up from the bottom edges.